Do you have ‘sun tan’ phobia? Everyday the bright hot sun, dirt and sweat play havoc with your skin. Sunscreen, umbrellas or caps are not enough to protect you from the sun. Tanning is the first sign of sun damage. Can you escape this sun exposure? Not really. Not without letting go of all the important and fun things in your life. Traveling to work or college, jogging, swimming, sun bathing to relax and de-stress, partying under incandescent lights, social networking on your laptop, photo shoots under halogen bulb - all these lead to tanned lusterless skin. Pond’s comes to the rescue by bringing you a new revolutionary product that can reverse the effect of daily tanning: Pond’s White Beauty™ Tan Removal Scrub. Now reverse your daily tan and restore fairness! Pond’s White Beauty™ Tan Removal Scrub contains a powerful combination of Tan Solve™ beads and 50% brightening cream that gently scrub away daily tan while making your skin fairer. Apart from gentle cleansing, these ingredients promote the natural process of cells being shed when they reach the skin surface. The result: bright, radiant and fresh skin. Light, radiant and fresh skin is a function of two attributes: Gentle Cleansing and Scrub. New Tan Removal scrub gently cleanses skin to remove excess oil and dead skin cells. It also scrubs off the tanned top layer of dead skin cells, so that the skin’s natural fairness is revealed. 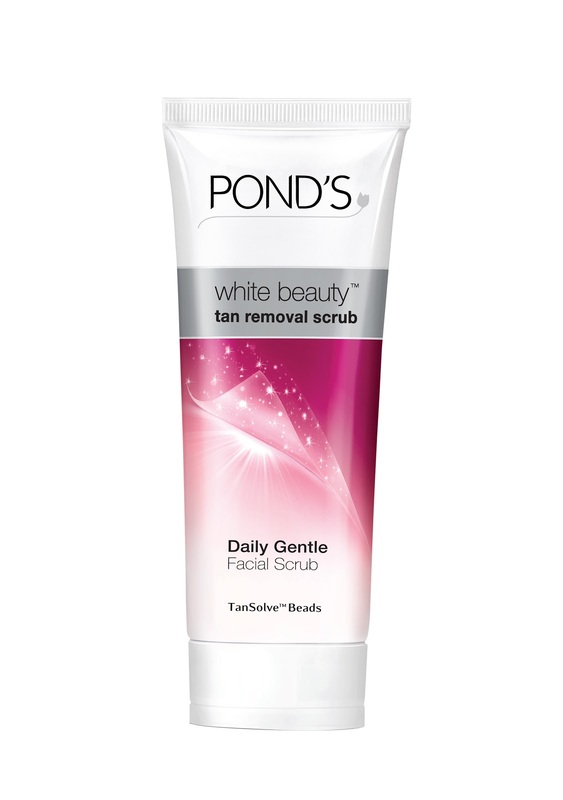 New Pond’s White Beauty™ Tan Removal Scrub gives you a reason to love the sun and at the same time reverse tan and restore fairness. The Formulation: The formulation contains TanSolve™ and 50% brightening cream. TanSolve™ beads are particles designed with varying size and shape to provide controlled breakdown, delivering scrub action. Tan removal scrub cleanses thoroughly and gently scrubs away the dead cells and daily tan restoring natural fairness. Hence, it effectively reverses tan and restores fairness. Now with the new Pond’s white beauty™ Tan Removal Scrub reverse your daily tan and restore fairness. skin care needs and requirements, Pond's delivers results women can see and feel. good and get more out of life. Sounds promising! Thanx for the info Rads! But Nilu don't worry... Mix Rice flour and Curd like a paste and apply it all over the tanned areas and then massage gently, leave it for few minutes, after that apply warm water and massage gently, now wash it off by cool water. Repeat this weekly twice. I tried that product. It's really good. I think It's the best product of ponds facial foam. I tried other others ponds facial foam. But it's the best. My face became glowing n no boack spots.